The best application for this sprinkler package is on soils with rolling terrain where the system is used for supplemental irrigation or with maxi gun systems. Approximate coefficient of uniformity under calm conditions = 92 – 94. Uses 10º and 27º sprinkler depending upon GPM. 25 1/2′ – 17′ spacing on systems. 50 PSI recommended at outer end. Wetted diameter = 110′ – 130′. Application rate at the outer end of system: 1000 GPM for a 1/4 section = 1.0″/Hr. This package produces smaller droplets than the other high pressure sprinkler package. The small droplet produced by this package generally reduces compaction of the soil. On most soils, the variable spaced package will produce less runoff than the other high pressure package. This is the best sprinkler package for those tough applications which involve heavy soils and rolling terrain. In most instances you will find that where it becomes necessary to go to a high pressure package, this one will prove to be the better performer. Approximate coefficient of uniformity under calm conditions = 95 – 97. Uses 10º and 15º sprinkler with vanes. 25 1/2′, 17′, 8 1/2′ spacing on systems. Recommended pressure at outer end with regulators = 55 + elevation rise/2.31. Wetted diameter = 90′ – 110′. Application rate at the outer end of system: 1000 GPM for a 1/4 section = 1.2″/Hr. The best application for this sprinkler package is probably on lighter soils where adequate pressure is not available for the high pressure packages or where spray nozzles would cause excessive runoff. 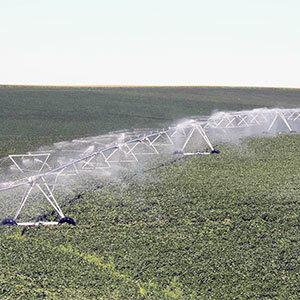 Low angle Pivot sprinkler with 10º trajectory and nozzles (two streams of water out of each nozzle to break up droplets). 30 PSI recommended at outer end. Wetted diameter = 60′ – 70′. Application rate at the outer end of system: 1000 GPM for a 1/4 section = 1.8″/Hr. Produces about the same size droplet at 30 PSi as high pressure impacts do at 50 PSI.